From the Archives - Hand Stitched Purse. 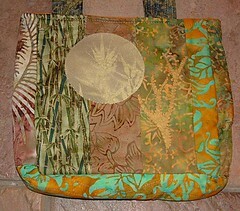 this is a purse i made in 2006. I am thinking I am going to make some more purses soon. I have a few little ideas swimming around in my head. What do YOU look for in a favorite purse or bag? 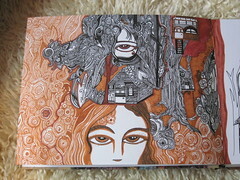 another page from my sketch journal. I am feeling under the weather again. Or maybe still? I think I am looking forward to spring. That little groundhog critter better cooperate next week! Maybe I need some more spring like colors, too. I have not many green markers! Anyway, this little scene looks like a soothing getaway, so I may stop in at one of those little cottages for tea - in my imagination, of course. right now i am drinking pg tips. happy creating, everyone. what are you working on now? 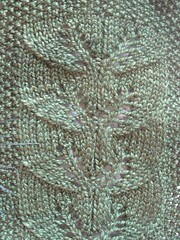 I am trying to finish up some knitting projects, rather than just starting new ones. I am not really sure why I set this skirt project down last summer but I've picked it up again and am enjoying working on it. 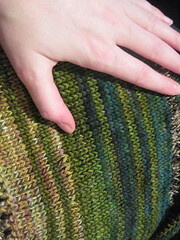 The two greens right under my hand in this photo are lovely hand dyed yarns from String Theory and Mountain Colors. I am making this pattern up. 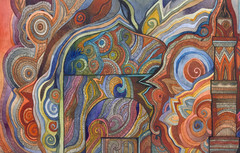 This is called "After Klimt" - in honor of Gustav Klimt. I really like his work though I have never seen any in person. Of course my own imagination always takes over so I am not sure Klimpt, were he here and actually cared, see much of his work in there but I assure you that the inspiration started there and then lead me down the twisty paths it always winds me down, deep into the forest, where it's so peaceful and quiet you would never guess there was a city out there, filled with people who are irritated at each other's driving, or are texting while driving, or are making "free" right turns without checking to see if anyone is in the cross walk 1st. Hm, i think I need to draw some more but it's time for work. I have been under the weather but am getting better, so back to the world i go. i've been under the weather and have not done much the last 2 days.. think i will be taking it easy today too. i have drawn a bit, some of it i had started earlier in the week. 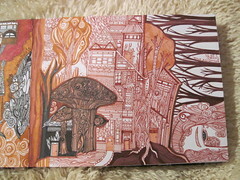 this one is called Forest among The Fungi. for those of you who commented on my last post, expect some good mail soon! allow a little extra time for the post if you live outside the US! Well I am still on a sabatical of sorts from doing formal finished art. and from doing art for sale. need to be done, look good, etc. but i am having a good time doing my own thing for me and am starting to get new ideas and so on so i think i will keep it up. This page is called Behind the Pink Doors. It was good to have a 3-day weekend. I was reading that in Great Britain the 3rd Monday in January is known as Blue Monday - the most depressing day of the year. Holidays over and Spring far far away. I think the US has somewhat eased that pain by celebrating Martin Luther King's life on the 3rd Monday in January (and some people get the day off.) But maybe they only defer the color blue... Tuesday is looking a bit bleak to me today. Not blue but grey, a color any Northwesterner is quite familiar with as it is the color of the sky for much of the year. Anyhow. I did have a restful 3 day weekend. Sketched some, knit some, watched some Torchwood and Sherlock. Read some. Went to a memorial service for the beloved father of a friend. and spent some time with my mother. If you need a little lift this blue Tuesday, The 1st 5 to comment will get something in the mail. But you need to give me your address too! 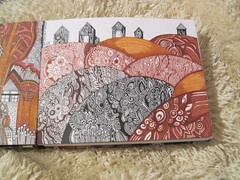 i've 2 more pages of my sketch journal up on flickr, if you want to click through to see them. i am not particularly into football, which i suppose is too bad as i am from seattle, but there you have it. i am hoping to spend today alternately cleaning furiously and enjoying breaks for knitting and so on. enjoy your sunday, however you chose to spend it. So I am working on a new series inspired by Islamaic architecture, but I am not entirely new to onion domes. 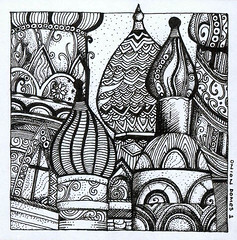 This little pen and ink drawing is something I did in 2006, inspired by the domes of Saint Basil's Cathedral in Moscow's Red Square. Wikipedia informs me that this cathedral is more formally known as :Cathedral of the Protection of Most Holy Theotokos on the Moat. That's a bit of a mouth full but I like it. Today has been long, the morning taxing my muscles as I shifted boxes around and up and down ladders, and this afternoon taxing my brain as I edited a catalog. I am ready for a long holiday weekend! And I might just get some painting in, we'll see. I am kind of taking a break from formal painting to allow my creativity to refresh itself after my intensive art making between September and December. I've been reading a lot and knitting a little. 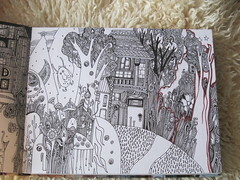 this is my new sketch journal. 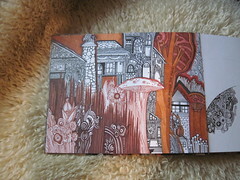 It is a journal designed by Sabrina Ward Harrison and it came from papaya art. 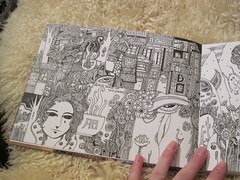 It is a nice size and it has lovely thick pages that are great for pen and ink. i got it for christmas and am very happy with it. it's been a rough day, i could use a cuppa. a good time to shop for valentine's day! Pantone says that pink will be the color this year, but I went for orange in this case. This hat was for a babyshower this weekend for a baby of unknown gender (well, unknown by me and its parents, it probably knows itself and will share that information soon when it feels like emerging.) anyway that being the case I decided bright orange would be good, and I suppose it has the added advantage of making your baby easy to spot in a crowd. 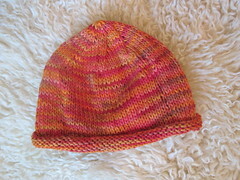 the pattern is Deep South Fiber's Basic Baby Hat. The yarn is Pima Cotton & Silk Hand Paint in the color called flame. Jesse sent me this cool article on Ammonites. Ammonites are organisms commonly found as fossils. They are related to Octopuses, Squids, and Cuttlefish. They look something like Nautiluses but are only distantly related. Read all about them! Obviously I am a fan, this is a painting I did featuring one last year. It's 20 x 10"
My friend Lou, who is a very nice person, gave me a copy of Peter S. Beagle's book The Rhinoceros Who quoted Nietzsche for Christmas. It was the 1st book I read in 2011. 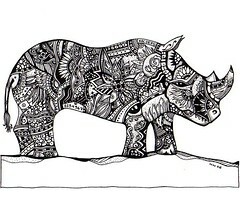 I love Rhinoceroses, as evidenced by this drawing made in 2006, and it was a delightful book. It made me want to go back and reread all the Beagle I've read, and track down and read everything of his I have not read yet. Not only was the fiction delightful, but it also included three charming essays, which I quite enjoyed. So I do recommend it. i have not painted in over a week. even though i love to paint and still have been getting ideas and things. 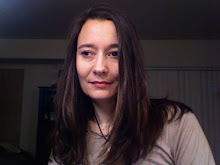 i think i just pushed myself too hard for a few months, and i had not been knitting as much, and i think i am just taking it easy a little to read and knit a little and get myself ready for whatever comes next. 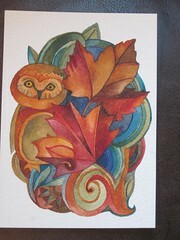 this is one of the last things i painted prior to my little holiday as it were, it's 5 x 7". just the sort of thing you would see when wandering the woods around here, but only if you looked very closely and weren't texting. This is a better image of Minaret 1. It's a scan, though the scanner is not quite big enough and cut the bottom 1" of so off. 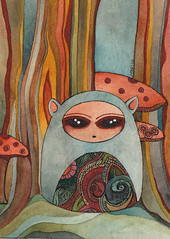 The original is 26x36 cm or 10 & 1/4 x 14 & 1/8". 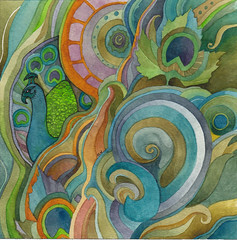 It's watercolor and ink (Pitt pens) on Arches watercolor paper, 300 lb coldpressed 100% cotton paper. i must have forgotten to write down a few.. I marked my favorites w/ an asterick. The yarn is lovely. I used all of 1 skein and a bit of the 2nd. I think the scarf was between 5'6" and 6' long. I believe the pattern called for 8' but I made mine a bit shorter. Anyway, it's a good pattern, well written, no errors -- give it a try! Pantone says a pink color will be the color of the year - but I've been into orange. 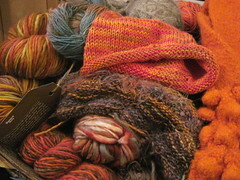 This is a pile of yarn and knitted items nestled together on my hassock. Here we have a orange shibori scarf my friend Kathy knit, on the right, a baby hat I knit in the center, under that a kimono in progress, and some other yarns awaiting transformation! 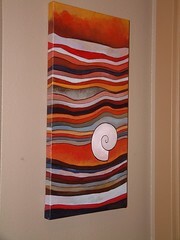 This is a painting I did for my friend Kathy and her husband, who I got to spend the day with yesterday. It was a nice way to end the year - wrapped up in a blanket, eating homemade paella and sipping punch! They live on Vashon Island - where I grew up - and a favorite place of mine. It's hard to believe I WAS really there because the power did not go out once. We did see 3 three deer as we left for the ferry, that was certainly appropriate! Fortunately none of them decided to wander into the road. Jesse met me at the ferry and we had a nice dinner, then he went out with his roommate and I went home and drew and went to bed. I'm not much of a party animal!